Black Star Riders have published a video for Finest Hour, taken from the band’s forthcoming album The Killer Instinct, the follow-up to 2013’s All Hell Breaks Loose. The Killer Instinct was recorded with Nick Raskulinecz, who’s previously worked with the likes of Rush, Deftones, The Foo Fighters, Alice In Chains and Mastodon. It’s released on February 23, but can be pre-ordered now. 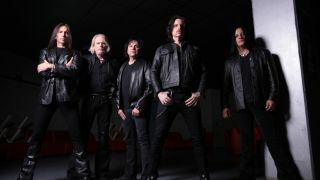 Since releasing the first details of The Killer Instinct in December and revealing more information last month, Black Star Riders have played at the Giants of Rock festival in Minehead. The album received a 9⁄10 review in the current edition of Classic Rock. Black Star Riders co-headline a UK tour with Europe in March.